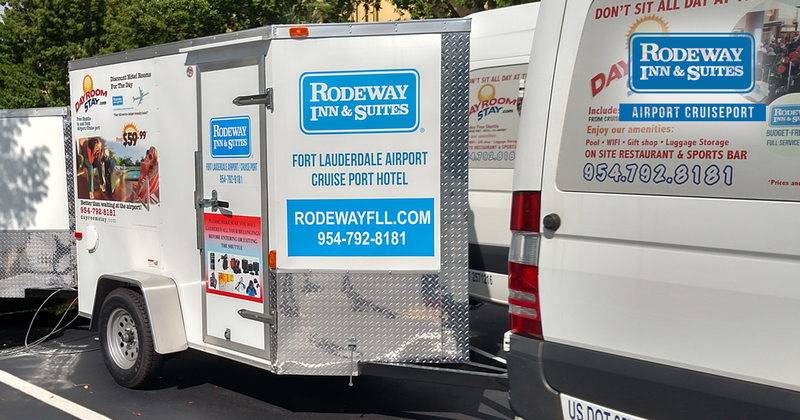 Our hotel, Rodeway Inn & Suites – Fort Lauderdale Airport & Port Everglades Cruise Port, recently received new luggage trailers for our airport shuttles and cruise port shuttles. Let’s start with why we have trailers in the first place. Our Fort Lauderdale cruise hotel specializes in cruise vacationers. Generally, it is a good idea to fly into the city from which your cruise ship leaves the day before the departure. You never know what can happen — a delay or cancellation of your flight will not give you enough time to make arrangements before the ship leaves if you are flying in on the day of. To avoid getting to an empty port to find their cruise ship steaming away into the distance, most vacationers fly into Fort Lauderdale the day before, stay the night with us, and get on their cruise ship the next morning. To make life much easier for our valued guests, we bought a number of Mercedes-Benz Sprinter shuttle busses, and started offering FREE pickups at the airport, and FREE drop-offs to Port Everglades cruise port for all our guests. To make the short drive to our hotel more comfortable for our guests, we also purchased enclosed trailers for their luggage. Luggage goes into the trailer, passengers go in the air-conditioned, smooth-riding Mercedes bus — vacation begins early, everybody wins. We, and our guests, loved the idea so much, we recently upgraded our trailers to enclosed, single-axle Cargo Craft Vector trailers. What this means for us? Better fuel economy due to the V-shaped design, meaning less pain at the pump, meaning more routes, and more frequent service for our guests. What this means for you? We can now serve you even better. More routes means that if you are leaving out of the Port of Miami, or arriving into Miami International, our optional routes, picking you up and dropping you off can be less expensive with the new trailers — everybody wins. So, as you can see, even something as little as new trailers for our free shuttle can mean better, more affordable service from us to you. Take advantage of our convenient, affordable hotel! Fly into South Florida early and stay at our Fort Lauderdale cruise hotel — after a good night’s rest, get on the way to your tropical cruise vacation! This entry was posted in Cruising and tagged cruise, Cruise Hotel, Fort Lauderdale, Fort Lauderdale Cruise Hotel, Free Shuttle, hotel. Bookmark the permalink.